Flatiron plastic surgery walks through the right path based on reasonable surgery fees and trust. Also, flatiron aims to zero side effect through precise pre and post op system. Flatiron plastic surgery keeps the original intention and try continuously to go beyond the best. Flatiron plastic surgery also shares the heart and sincere communication with clients. Flatiron plastic surgery performs eye, breast, revisions, anti age, rhinoplasty, facial contouring and body contouring. Directors at flatiron plastic surgery are Jaehyun Park, and Seung jun Kim. 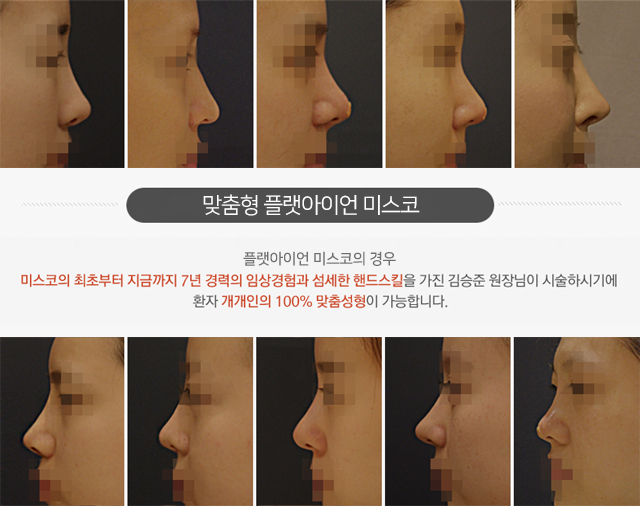 Seung jun Kim invented ‘missko’ rhinoplasty which is non incision rhinoplasty, and only he can perform at flatiron plastic surgery. Also, some Korean actors had rhinoplasty with him, and he is also well know for rhinoplasty revision. There is ageing laboratory at 4th floor, and flatiron is studying and researching to solve ageing problems relating to stress, skin ageing and pollution in the environment. For more questions, please contact us. we are willing to help all those who want to be beautiful outside also inside! You can click 24hour online consultation chat on this website, or email us (tmmee7@gmail.com). Also, you can contact us through facebook(@tmmee kim), instagram(@tmmee7), twitter(@tmmeekim) and wechat(@tmmeecn)!